Thermal Cleansing Balm: Balms are my favourite method of cleansing and this is one of my favourites ever! I must be on my ninth tub of this balm at this stage, which in itself speaks volumes about how much I love it. It has a soft, pliable texture which makes it a pleasure to massage into the skin, it then melts and after massaging further, it is removed with a damp cleansing mitt or cloth. It can be used as a makeup remover because it literally dissolves every last scrap of makeup (even stubborn mascara and eye liner) or as a second or morning cleanse. It leaves the skin thoroughly cleansed but not stripped, soft, comfortable and plump. At the moment, Cult Beauty still have The Moor Mud Set still in stock from the Christmas collection, which contains a full size Thermal Cleansing Balm, a deluxe mini Deep Cleansing Mask, a deluxe mini Refining Facial Polisher and a Mini Cleansing Mitt so if you are interested in buying the cleansing balm, I'd recommend going for the set! Queen Of Hungary Mist: This mist can be used in a number of ways - as a hydrating spray after an acid tone, to refresh skin throughout the day or also to refresh makeup throughout the day. It has a very fine mist so there is no fear of soaking your face and the rose and neroli scent is very uplifting. I find that it adds some hydration and dewiness to my skin but there isn't even a hint of the wet/glitter look. If you spend over £90 this month on Omorovicza, you can get a free full size of this mist with your order! Omoressence: The product that banished signs of dehydration from my skin within the first few uses. 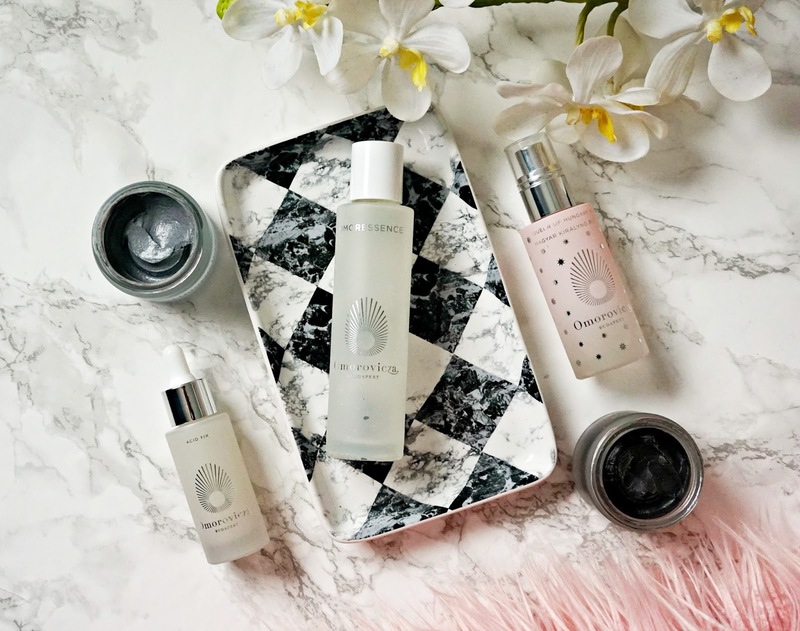 A few drops of this product are patted into the skin after cleansing, toning and misting and then I give it a few minutes to sink in before proceeding with the rest of my routine. It is so soothing and hydrating, leaving my skin instantly plump, calm and comfortable. It is an essential part of my daily routine and although expensive, it lasts a long time. My love for this product knows no bounds. Ultramoor Mud Mask: The product that I have previously described as Spanx for the face (here) because it really does lift and firm the skin. Not only that, it also deeply cleanses the skin and the result is bright, clear, radiant, firm skin that glows like I've just had a facial. It doesn't get better than that! Acid Fix: This is a recent addition to my collection but I have been using it for almost three weeks now and I had to include it because, for me, the results are visible the morning after use. It contains a combination of glycolic, lactic and salicylic acid so it targets the skin in a number of ways by exfoliating and gently peeling the skin. I apply around 2/3 drops at night, twice weekly, after cleansing and follow with a moisturiser. It can tingle slightly initially but it doesn't make my skin red or in any way uncomfortable or inflamed. The next morning, my skin is clear, plump and glowing but not at all flaky or dried out in the way that it can be after some acid products. It should last a very long time, given how little is needed per use. Have you tried any of these products or anything else from Omorovicza? I'd love to hear your thoughts on them and on the brand in general! Don't forget that there is free international shipping on all Omorovicza products with Cult Beauty this month so if you are interested in trying any of the products, now is the time! All products are bought by me, unless otherwise stated. Acid Fix & Omoressence were kindly sent to me but this post is not sponsored. Opinion is always my own.